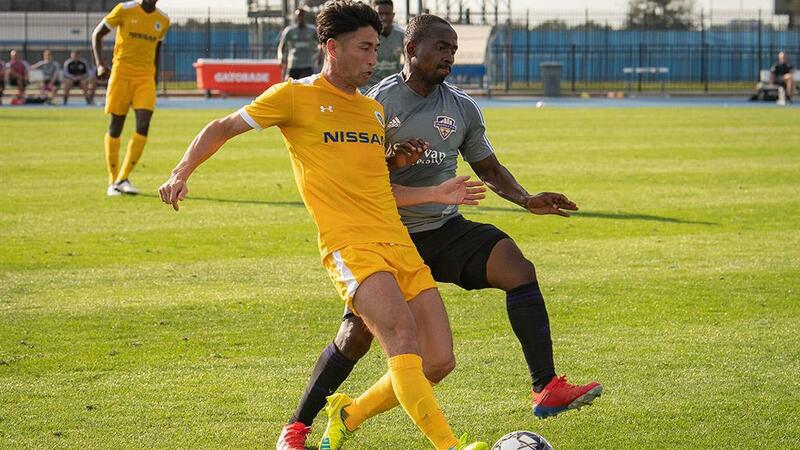 BRADENTON, Fla. – Two teams expected to be among the Eastern Conference elite met in preseason action on Saturday afternoon at IMG Academy, with Nashville SC edging out back-to-back USL Cup champion Louisville City FC by a 2-1 score line. Tucker Hume and Alan Winn netted on either side of Paco Craig’s header in first-half stoppage time to give the Tennessee club something to smile about before heading home on Sunday. While NSC players were pleased to end their week-long Florida camp with a victory, they were clear that the result against the defending champion wasn’t a statement of intent heading into the 2019 season. While those statements could be a way to temper expectations ahead of the upcoming campaign, they more likely represent an immense level of respect for a Louisville side that has not only won the last two USL Cups, but also carried the play for long stretches Saturday afternoon. Louisville outshot Nashville over the 90 minutes and racked up double-digit corner kicks, piling on the pressure late in search of an equalizer. That equalizer never came but Louisville still had plenty of positives to take away from its second straight preseason defeat. 1. 2018 USL Cup MVP Luke Spencer led the line for Louisville City during the game’s opening 45 minutes, during which Head Coach John Hackworth opted for what presumes to be his starting lineup when the club kicks off its regular season in four weeks’ time. Spencer, who scored just five goals during an injury-hit regular-season campaign last year, will be expected to shoulder more of the scoring load this year given the offseason departures of Cameron Lancaster and Ilija Ilic. The 28-year-old forward put in an encouraging performance and was unlucky to not get on the scoresheet after forcing Nashville starting goalkeeper Matt Pickens into a pair of fine saves over the opening half-hour. 2. Kharlton Belmar was the only one of Nashville’s three headlining offseason signings to start the contest, manning the left wing of a 4-2-3-1 formation for the opening half. The former Swope Park Rangers forward played a role in the opening goal, collecting the ball in a pocket of space before turning and firing a shot that stung the palms of LCFC goalkeeper Tim Dobrowolski. Winn found the rebound and diverted into the path of Hume to tuck home on 24 minutes to open the scoring. Belmar, who also spent some time as the lone striker, showed flashes of his pace and put in a decent shift with his new teammates. 3. Louisville City FC has had a lot of success over the past two seasons converting from set pieces and the trend looks set to continue into 2019. The side’s lone goal came from a left-wing free kick in first-half stoppage time, as Oscar Jimenez delivered a dangerous ball into the box that found the head of Paco Craig and deflected off a body before crossing over the goal line. Jimenez, who led the USL Championship with nine assists from set plays over the 2018 regular season and USL Cup Playoffs, continues to be a weapon that teams are going to struggle to deal with. 4. After spending the past four seasons with Louisville, Cameron Lancaster made his Nashville preseason debut against his former club Saturday, coming on as a substitute on the hour to replace Kharlton Belmar. The Englishman lacked service during his 30-minute run out and headed well over the crossbar on his only shot of the afternoon. After seeing his first game action since limping out of the 2018 Eastern Conference Final with a hamstring injury, Lancaster was happy to be back on the pitch with his new teammates. "It's was good. It's been a tough week of preseason training, so it was nice to be able to get out [there] and get some minutes." After claiming the USL Championship's Golden Boot with a record-setting haul of 25 goals during the 2018 regular season, Lancaster was ready to set some even loftier goals for 2019. "I suppose 25 goals is the minimum expectation but we'll see," Lancaster said. "I'm going to give it my utmost effort on the pitch and we'll see where we go from there." 5. The brightest performance of the second half was fittingly turned in by Louisville forward Sunny Jane, who sat behind fellow offseason signing Lucky Mkosana in the No. 10 role. Jane showed off his versatility, expertly turning in traffic with the ball and spreading it out wide in the team’s build-up play. He also flashed an eye for goal, drilling a left-footed effort off the crossbar in the 66th minute that would have broken a 1-1 tie. Jane was tireless in the team’s press and hit the target again five minutes from time, evading the wall with a dipping free kick that Sparrow tipped over the frame of the goal. The 27-year-old, who joined from Cambodian club Phnom Penh Crown, looks like a lively addition to Louisville’s attacking arsenal.